Rock And Roll Piano Lesson – Classic, Fast, And Easy! In this lesson, we’re going to talk about rock and roll piano – well, I guess I should say rock ‘n’ roll, to be official. This will hopefully be a very simple lesson for you, because rock and roll piano uses some very simple structures. 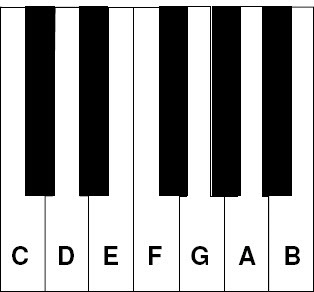 Before we do anything, here’s a picture of the piano keys and note names for your reference. This pattern repeats up and down the piano, so the note names remain the same – they just make higher or lower sounds. First, let’s talk about the chord progression. If you’ll recall from some of my other lessons, the roman numerals correspond to chords based on scale tones. Capital numbers are major chords, and the number corresponds to the scale tone of the chord root. Now, let’s talk about each hand separately, then we’ll put them together for the finale, OK? OK, so what does THAT mean?! Well, those numbers represent notes in the major scale in whatever key you’re playing. For a song that’s “in 4” (4/4 tempo – 4 beats to a measure), simply play this pattern over and over in your left hand. It’s kind of like putting together the pieces of a puzzle. In fact, that’s exactly how I think of it when I learn a new tune. And if you’d like to dive in a little deeper, you might want to check out my Rock and Roll Piano… FAST online/DVD video piano course. This entry was posted in Piano Lessons and tagged free piano lesson, learn piano, piano chords, rock and roll piano, Rock Piano, rock piano chords by Bill. Bookmark the permalink. Oh, Bill! I’m a classically-trained pianist and organist and I have always wanted to play jazz. I have taken careful note of each of your lessons but find it all a little bit too much to take in all at once. (It’s probably my age!) I will continue to try, however, and when I have an odd moment I will practise! It is extremely generous, kind and gracious of you to give these free lessons. If I make some progress I will let you know. do you have a diagram showing where the notes or letters go on the keyboard. Yes, I just put a diagram in the post – thanks for the reply! Sorry, don’t get it. I do not know how to read music, play by ear a bit. would like to learn basic chords and maybe sheet music later. right now what your talking about c-d-e what ever along with strange numbers, do you have pictures of the keyboards telling us where and how to place our fingers per chord. I do have a portable keyboard Casio, its old and has a few instrument banks etc…but I would rather learn the real way…can you help or am I wasting my time! Sorry about that, Claude. I just included a piano note chart for everyone. so much to learn, thanks for the help. No problem, Joyce. You can either subscribe by clicking the orange RSS “thingy” in the upper right corner, or simply submit your name and email address in the box at the top right of the blog again. I’ve a black thumb with music, but these lessons are a swell undertaking of yours. Jeremy, C is 1, A is 6 (below it), G is 5 (below A), and back to C (1). Sorry Jeremy – I should have paid more attention – you were right the first time! The chords between your second and third pair of parentheses are identical: (2 bars of IV). Shouldn’t the latter of these two by (2 bars of I) again? Also, isn’t this the basic boogie woogie chord progression? You’re absolutely correct, Will, and I’ve made the correction – thanks! Yes, you’ll find this progression in blues, rock, boogie woogie, and in lots of other places. Bill, I just want to thank you for inspiring me to start learning piano again, your course was right on point and easy to follow. I play piano and organ at church and find your course very helpful. Let me know if you have an advanced follow-up course that I can get. Keep up the good work. Hi Bill, I had almost given up on learning to play the piano. But you have been such an inspiration with your tips etc. I am 70 as of today, and I enjoy the piano so much. thanks for all you do. In today’s email you hope we learn to ‘rock hard’ — but at my age, that wouldn’t be easy. out. …Do you teach trumpet?? Oops… quite right, Dave – sorry!! I was too busy playing it in my head and not typing it correctly on the computer keyboard! YES! It should be C A G A – THAT’S 1656. May I suggest, Bill, that you extend your keyboard to include at least one more octave, preferably two, so that beginners can better appreciate where to place each hand? Hi Bill, how about some MP3 files. To hear the pattens would round out the lessons making them completely foolproof. thanks so very much ; you’re awesome to give of yourself free lessons; i love to see what you have next. Hi Bill thanks for the free lessons. I can play with notes but i always wanted to play by ear. I am 74 years old. Any tips on playing by ear? tks. Hi Bill, Thanks for the mail, I have printed off all the previous lessons you have sent, only need a bit of spare time now to mull over them, I do play reasonably well so when I sit down at the keyboard tend to go straight into playing mode rather than practice which is naughty I know, but promise to use all the material you have sent as there is always room for improvement,the only parts I have found a bit confusing are thr roman numerals,but on further investigation I am sure all will be clear, also would love to be able to play by ear, as I tend to need to see the music,my one advantage I can read music so a lot of what you write makes sense. As have mentioned before I also do a lot of painting so its just having enough time to juggle the two hobbys. Thank you for getting in touch again. I would give anything if I could understand how the hell you do the above lesson as you have instructed. Example: EC-F-A doesn’t go together nor sounds right. ……hey Bill. Am really taking my time with this page . Opportunities for having fun at church abound because of being “drafted” to play the service hymns every Sunday due to sudden resignation of organist.Am transferring every lesson to manuscript for practice.You should of heard what was done to “Jesus loves me”, last week.You would be proud of youself. OK–I am not sure how to reply? When I subscribed to your lesson I was sceptical. How this men can teach me play piano over email ? Today I know. You are great teacher !!! In the past I Played acoustic Bass and Bass guitar ii a jazz band. Also played 2nd trombone in a brass band, with folk music on classic guitar and mandolin. My keyboard is limited to playing classical music but I would like to play some appropriate jazz on keyboard. Having suffered a stroke some time ago there is some impediment to learning but I find your lessons interesting and serve to get my mind back into shape. Please keep up the good work. PS. I don’t expect to reach professional standards on account of lots of health problems affecting my arms and hands. I HAVE LEARNED A GREAT DEAL FROM YOUR LESSONS AND AM IMPROVING WITH PRACTICE, THANKS A MILLION!!! thanks for the love you have to give piano’s free lessons.God bless you BILL! Thanks so much for your help. This is great. I’m looking forward to more of your work. Hi Bill. Greetings from Aus. Thanks for giving us your time and inspiration. Many of us need all the help we can get. Hi Bill,You are great teacher. Thank you so much for sharing your blessings with us. Just like to thank you very much for all the valuable lessons Bill. You have a talent for making things simple while taking a light and entertaining approach. I am recommending you to my music-deprived friends, bravo and all that jazz! I did not mean to drop your lessons. I just clicked on the cancel address thinking it was a lesson. Please do not drop my lessons that you send. Sure, Les. What questions do you have? very easy to learn, looking forward to continue. Many of us can read music if only a little, so it would be great to include the score if possible – and it would also help to teach non-readers to read the dots! It would mean a departure from simple text but oh so rewarding for your clients! i lost the information…Please send it to me again asap. Thanks for time well spent! everything you are teaching is helpful. you have simplified some of the lessons….as far as “playing by ear”, at that point all bets are off. Lessons won’t do them any good. I tried it years ago, but kept bumping the side of my face on the keyboard…impossible on a accordion…. thanks a lot its a big important for me that i have learn more how to play and study of all notes thanks for your kindly sharing for us. Nice work your tips are very helpefull, i love that, i would like to learn play by the ear, can you teach, a exercice? Thank your for doing this and making it free. I was having a hard time understanding chords and scales but you have cleared that up for me. thanks you sir i really love piano… your post help me a lots.. keep on posting sir…nice job… God bless you..
Good teachers make details open and interesting without a lot of bruhaha. You have it down to a science Bill. I join the ranks of those most appreciative.